On The Edge of Blogging ! Since we started our blog in 2010 there is now a plethora of social media demanding our time (and even more companies constantly offering to train us on how to use it! ), so for now this old blog is a nice nostalgic look back at the few posts we did manage. We still spend most of our time making picture frames on time rather than writing things for Facebook, Twitter, Instagram etc. etc., but we're on those platforms, so we'll see you there. Not Quiet . . . . . Okay, okay, I know I haven't added to this blog for 6 months now, but it's not because I'm being lazy, it's because we're really, really busy - and what with the likes of Twitter and Facebook, we could easily spend our life writing blogs, tweets and gawd knows what else. So if you are reading this, then please don't think we're dormant - we're anything but! We're concentrating on getting frames made . . and made . . and made . . . . . It all takes time ! 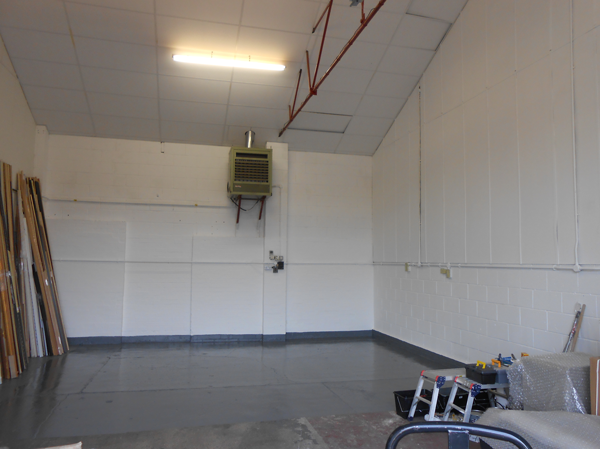 It all takes time, but at last the new workshop is 90% operational. Last weekend was the big day with the long awaited knocking through of the wall. Yippee! The fantastic racking, from the fantastic people at Recon Storage of Peterborough has been delivered and installed - but only after I had to redo my measurements! 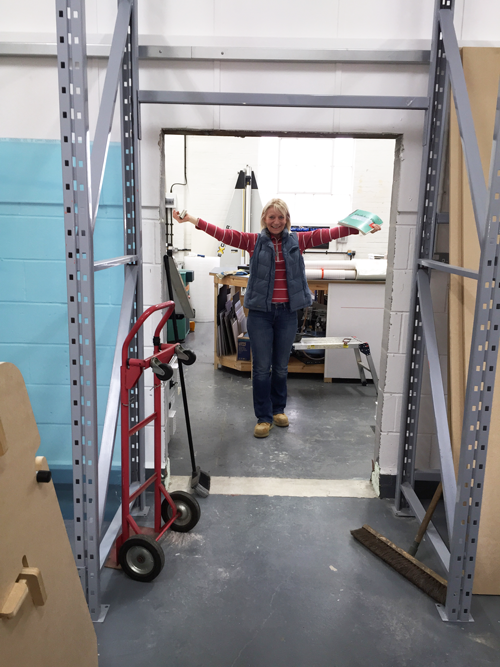 The wooden moulding racks are made and we can at last see what we have in stock - and be able to reach it! The new saw, the new underpinner, and the new vertical rotary guillotine are also all in and working (sort of). There are a few tweaks to do, but we’ll sort that. So, on with the Christmas orders (yes, the board is full already) and hopefully we can concentrate a bit more on our customers once more. Sorry if I’ve been a bit distracted when any of you have called in. A lot to organise !!!!! Progress with the new workshop is slow, but it is progress! To keep up with the demand we’re adding yet more equipment. Now it’s probably a boy thing, but don’t ya just love big toys that arrive in big boxes?! 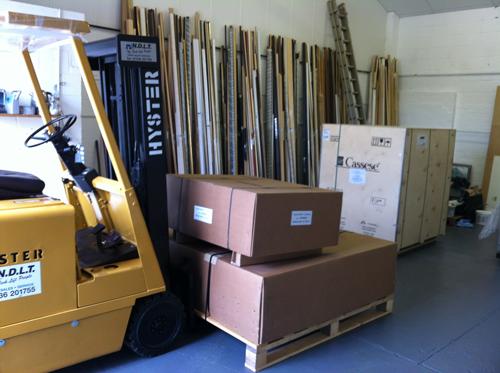 And how much fun is our new forklift that we share with one of our neighbouring business pals! Yes it definitely is a boy thing! Lurking under these cardboard boxes we have a new mitre saw and a new computerised mount cutter. They don’t come any better than these bits of kit, so all being well we’ll be able to keep our quality as high as we possibly can. We just need to get them installed now - and that’s no small job. Incidentally, it’s interesting that the Cassese 969 mitre saw arrived on time from the French manufacturer, the Valiani mount cutter arrived on time from the Italian manufacturer, and the dust extraction system that was ordered from a UK manufacturer is now due to be 3 to 4 weeks later than their promised 3 to 4 week delivery - so about 6 or 7 weeks - and we all wonder why UK manufacturing is in the doldrums?! 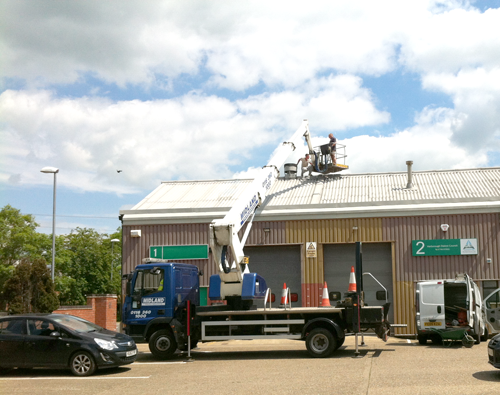 At last - we’re nearly in to our new unit. More room to make picture frames, more room to store stock, more room to move !!!! Phew! As anyone who visited in the last year will know, we’ve been somewhat crammed in our unit. Our expansion arrangement didn’t quite go to plan as the unit we were supposed to be moving to just kept leaking! So plan B is to knock through to next door. There’s plenty more to do before we’re fully moved, but the first coat of paint is on! Watch this (nice new empty) space! We've Gone Even More Hi-Tech ! We’ve gone high-tech! We’re just finishing a project to digitally scan every print, mount or framing order we’ve ever taken and store them on some enormous database in ‘the cloud’ (a posh term for a big computer that no one knows the whereabouts of! ). Why?, because it means we can now instantly lookup the details of any order that anyone has placed over the last 10 years. We’ve always been good at storing every orders sheet in alphabetical order, but with thousands of customers and thousands of orders it was getting bit difficult to find something quickly - and crawling around in the bottom draw of the filing cabinets just hurts! We are regularly asked for “the same frame I had 3 years ago” or “just the same mount colour as last time” which is all information kept on the orders sheets and now at our finger tips. 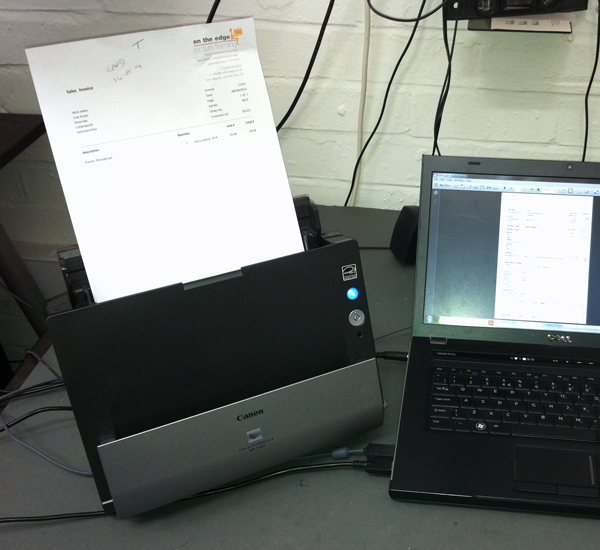 For the techies amongst us, the fantastic little Canon scanner we bought scans 20 double sided pages a minute and automatically creates an indexed PDF. We love the gadget - it is our favourite new toy. And we love the software that we had specifically written for us by a local development company. Even poor Maddie, who has spent the last month and a half feeding-in thousands of order sheets, actually loves her toy. She’s possessive about it !!! Maddie has been our secret filing girl and tidier-upper for about a year now. Initially she came after college but has recently been full-time. We also congratulate her on getting her A levels results today, all above the grades she was expecting. Well done Maddie - and no, A levels don’t give you an automatic pay rise! 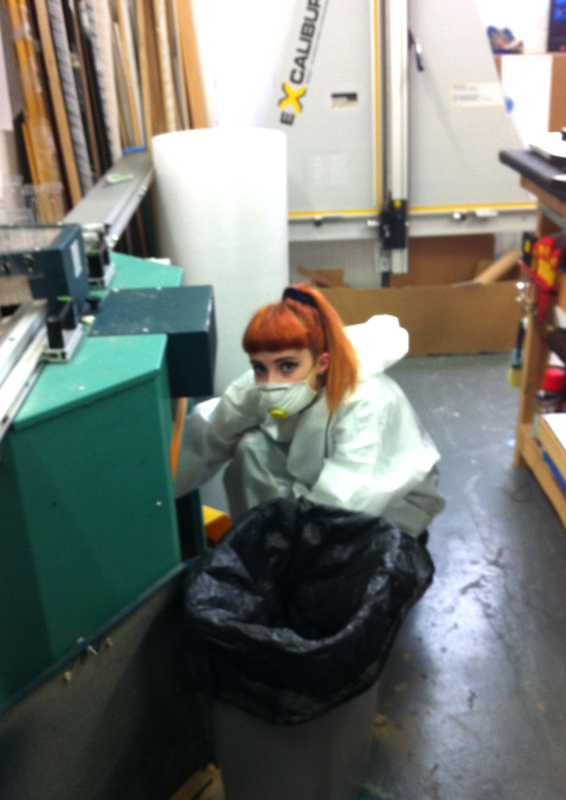 Below is Maddie doing her second least favourite job - clearing out the mitre saw! 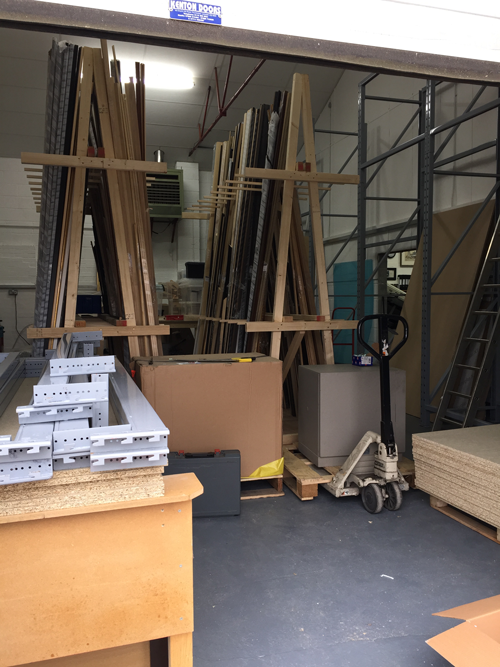 Okay, so the word is almost out - we’re expanding and need a new warehouse to store all our stuff. We’ve almost got the keys, but one small problem - it leaks! Not exactly ideal ! However, fear not, the men with crane are at work. So watch this space we’ll let everyone know when we do, eventually, get more space ! However, that does prompt a question - why did we choose the picture framing industry where everything is so big? Big sheets of board, big bits of glass, long bits of wood, big boxes etc. etc. How we wish we’d done something like sell mobile phones - loads of small boxes and a few padded envelopes! Oh well!